The New Year always starts with a bang thanks to Honeybell season. The fruit matures in early to mid- January and usually only lasts for a few weeks before the fruit becomes overly mature. Demand always exceeds supply at the start of the year and crews fan across the state to harvest the first Honeybells and rush them back to the packing house amidst a cacophony of ringing phones and recipients desperate for their Honeybell fix. Of course the Honeybell season actually begins quietly, in the Spring, when the rising temperatures and Spring rains cause the Honeybells, and all citrus varieties, to burst into bloom. The air is filled with their sweet perfume and it seems that there is nothing more wonderful than the smell of citrus blossoms carried on the breeze. But in the Spring of 2015 something very unusual happened: the Honeybell trees blossomed as they always do in early March. But, imagine our surprise when, three weeks later, they bloomed again! We can’t remember this ever happening before. Ten months on we were confronted with the unusual situation of having essentially two crops on each tree, one maturing three weeks later than the other. The picture above, taken on January 23rd, 2016, shows two Honeybells side by side on the tree, partially obscured by leaves. The Honeybell on the left is orange-red in color and has the classic Honeybell flavor. The one on the right is yellow in color, and while it has good Honeybell flavor, its acid level is higher, making it more tart. Sampled alone, both would be enjoyable. But when sampled together you would be inclined to think that the one on the right is not fully ripened. As you can see, It’s not that easy to distinguish between the two on the tree. Many have chosen to harvest all the fruit at once. But packed together in the same gift box, the contrast would be most apparent. 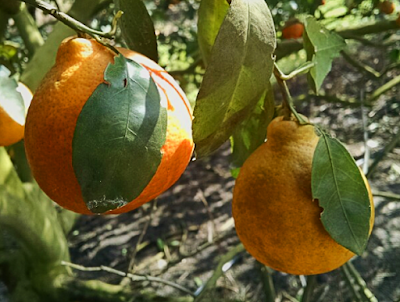 We elected to treat them as two different crops, letting the piece of fruit on the right, and all other like-minded Honeybells, continue to ripen and reach peak flavor and maturity. To accomplish this, we trained each individual harvester in the field to distinguish between the two blooms on the tree. No one is perfect, so we also trained each packer to recognize the two blooms in an effort to ensure that no mistakes made it into the gift fruit cartons. Only then did we begin harvesting the first bloom and filling fruit requests. We have almost completed the first pass and are now looking at harvesting the second flush of fruit just now reaching its color and flavor peak. Weather permitting, the Honeybell season could last through February, and that is very unusual indeed.